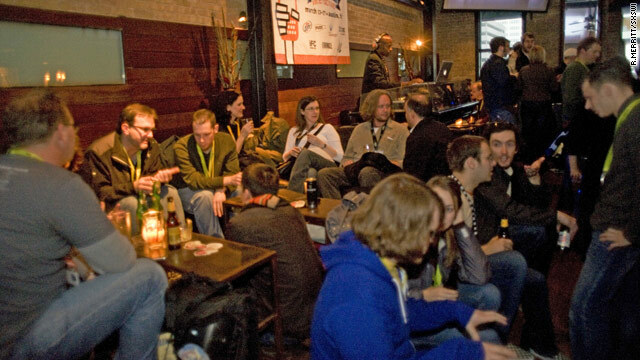 South by Southwest Interactive is as much about networking, like at this mixer last year, as panels and presentations. Editor's note: CNN will have complete coverage of the 2010 South by Southwest Interactive Conference at www.cnn.com/TECH and @cnntech on Twitter. AUSTIN, Texas (CNN) -- It's billed as a showcase for the brightest minds in technology -- a place to network with industry leaders and see the latest Internet innovations. South by Southwest Interactive -- a tech conference not to be confused with the related music and film festivals -- kicks off today in Austin, Texas. But tech entrepreneur Dennis Crowley has another term for it. "It's spring break for nerds," said Crowley, a co-founder of Foursquare, the mobile game and social-networking application that debuted at the event last year. The South by Southwest (SXSW) festival was founded in 1987 to showcase a burgeoning music scene in Austin, Texas. A week for interactive and film showcases was added in 1994. Last year, 11,000 people registered for the interactive festival alone -- with organizers expecting maybe 15,000 this year. Since its inception, South by Southwest Interactive (SXSWi) has been the launching pad for some of the online and technology world's biggest new ideas. Twitter, the micro-blogging site with more than 70 million users, debuted at SXSWi in 2007. Last March, Foursquare went live the day before the festival began. Crowley said he expects the application to hit a half-million users before this year's SXSW starts. Blogging platforms that make the Web more social have launched in Austin, while video sites like YouTube have gained traction by exposure at the festival. For developers, the concept is simple -- put your product in front of the plugged-in tech crowd that flocks to South by Southwest. If they like it, they'll spread it to everybody else. "More and more, we see companies taking advantage of the key influencers and 'digirati' that are here," said Shawn O'Keefe, producer of South by Southwest Interactive. "They realize that if they can make their product successful at South by Southwest, they can make it successful anywhere." But the spirit of the show remains focused on ideas, not products, O'Keefe said. he says sets the five-day conference apart from events like the gadget-driven Consumer Electronics Show in Las Vegas. "Not that we don't have a lot of companies involved as sponsors, but we tend to focus on the community and people doing creative things," he said. "It's about making things and doing new things with technology to make the world a better place." Among the anticipated highlights of this year's conference are keynote speeches by Twitter CEO Evan Williams and Daniel Ek, CEO of free music service Spotify, and a wide range of panels with such intriguing titles as, "How I Lost My Job Through Twitter, Again" and "Duh! It's, Like, Tech for Girls." And the exchange of ideas doesn't just happen during the official events. "It's a completely different atmosphere," said Foursquare's Crowley, comparing SXSWi to other tech events. "There are a lot of parties. It's almost more valuable to go to the events outside the convention center than the ones in the convention center." Not that the event hasn't gained its detractors. Some in the tech community say that the power of South by Southwest was its outsider credibility, and that it's gotten too big and mainstream to be a true force for innovation. Paul Carr, of the technology blog TechCrunch, wrote this week that the festival has become too much of a march from industry party to industry party -- with a little Internet celebrity gawking thrown in -- to be of value. "The idea that SXSWi is a conference -- or even a festival -- for people doing interesting and useful things in technology is a fallacy," Carr wrote. O'Keefe counters that the event continues to evolve. He said that while the festival received more proposals for panels than ever before, organizers were more selective about which were approved. And he said this year's layout will put events involving similar topics close to each other, in effect creating a series of mini-conferences that will let like-minded people move in smaller, more intimate circles. "It's about creating these micro-events within the larger event," O'Keefe said. "You can still very much experience that." Even Carr's criticisms seemed to come with a dose of mixed feelings. After all, as he writes after urging readers not to go to the festival, he'll be moderating a panel on Saturday. "See you in Austin," he wrote.